For decades, Silver Spring's most prominent intersection has been home to a gas station and a giant blank wall. Soon, a new hotel could fill this hole in the urban fabric. Looking at the proposed hotel from above. Images from the Montgomery County Planning Department unless noted. County planners are currently reviewing a proposal to build a 173-room hotel at the corner of Georgia Avenue and Colesville Road, two blocks from the Silver Spring Metro station. The hotel is geared towards long-term travelers, containing studio apartments with kitchens and a handful of one- and two-bedroom suites. The proposal includes some features that would be available to the public, including conference rooms, a rooftop deck and bar, and 4,000 square feet of ground-floor retail space, including a coffeeshop. 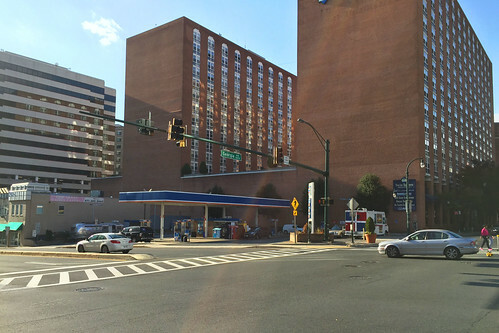 The sidewalks around the hotel, which today are narrow and have lots of curb cuts for the gas station, would become wider and gain street trees, and there would only be a single curb cut on Colesville Road. The corner today. Photo by the author. Together, wider sidewalks and new retail will bring more street life to this stretch of Colesville, which is centrally located between the Metro and the AFI Silver Theatre, but has few reasons for people to stop. The hotel will also have fewer parking spaces than the county requires, with 28 spaces instead of 89. Guests would instead have to park in one of the nearby public parking garages; in Montgomery County, developers can provide less parking if they pay a fee to the Silver Spring Parking Lot District. This allows hotel guests to use the parking that already exists in Silver Spring, as over 40% of downtown public parking spaces are empty at any given time. Compared to the thousands of apartments that have risen in downtown Silver Spring over the past few years, a new hotel is a surprising twist. There are several hotels in the neighborhood, but the only apartment-style hotel is the Homewood Suites on Colesville Road. This could provide a new option for long-term travelers, like the visiting families of veterans recuperating at Walter Reed Hospital in Bethesda. The proposed hotel seen from the corner of Georgia and Colesville. 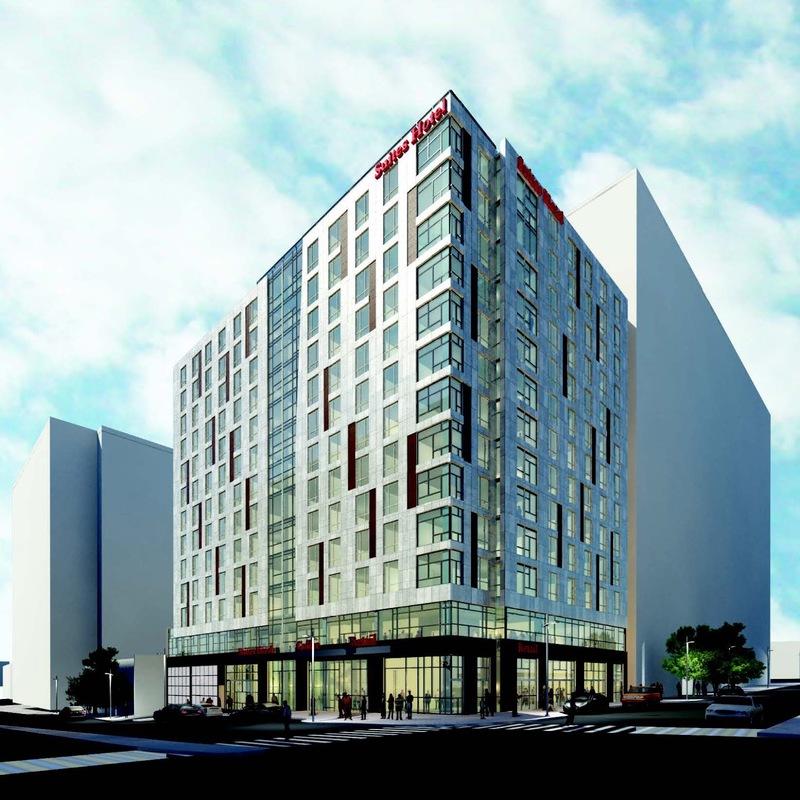 We don't know who will operate the hotel, though Starr Capital's renderings look very similar to a Hyatt Place hotel that opened last year in southwest DC. However, the developer claims that the hotel design was inspired by the actual "silver spring" that town founder Francis Preston Blair discovered in 1840, with metal and glass panels that "[recall] the changing patterns of the shimmering rocks of the spring," they told the Planning Department. The new hotel will cover up the 15-story blank wall of its neighbor, an apartment complex called Twin Towers best known for its funky, 1960s-era sign. But it'll create a new blank wall on its south side, where the adjacent building is just two stories tall. The developer proposes placing a large mural there, giving people walking up Colesville from the Metro something to look at. Also could serve the many federal employees who go back and forth between this area and temporary overseas assignments. A hotel without available parking is a horrible idea.